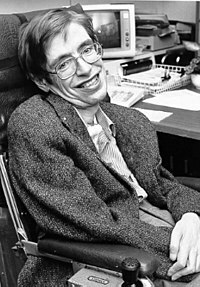 Stephen William Hawking (born January 8, 1942) is an English theoretical physicist and mathematician. He is one of the world's leading theoretical physicists. "There ought to be something very special about the boundary conditions of the universe and what can be more special than that there is no boundary?" Simple: There has to be something very strange about the boundary conditions of the universe and nothing can be stranger than that there is no boundary. "For millions of years, mankind lived just like the animals. Then something happened which unleashed the power of our imagination. We learned to talk and we learned to listen." Simple: Humans were ordinary until we learnt to talk to each other, then we were able to use our imagination to do special things. "Although September 11 was horrible, it didn't threaten the survival of the human race, like nuclear weapons do." Simple: The terrorist attacks in the United States of America on September 11, 2001 were horrible, but they were not a threat to the survival of the human race, the way nuclear weapons are. Simple: If life is not funny, then it would be tragic. ↑ The Anthropic Cosmological Principle (1986) by John D. Barrow and Frank J. Tipler. ↑ British Telecom advertisement (1993), part of which was used in Pink Floyd's Keep Talking (1994). This page was last edited on 2 December 2009, at 10:11.